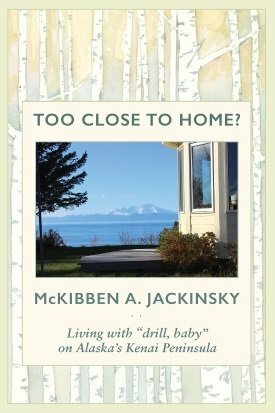 McKibben Autumn Jackinsky's Russian-Alutiiq great-great-great-grandparents were among the founders of Ninilchik village on the Cook Inlet side of the Kenai Peninsula. As a longtime Alaska journalist she has reported on the oil and gas industry from several perspectives. Now, with what author-activist Adam Briggle calls "an all too rare open-mindedness," she has interviewed families affected pro or con by the industry's presence in the area, as well as civic leaders, alternative energy advocates and others. In four unsparing chapters woven through Too Close to Home? she also tells her own family and personal story, on the way to a decision about oil and gas exploration on her inherited three-acre share of Jackinsky land. The book includes an extensive bibliography and a full index.